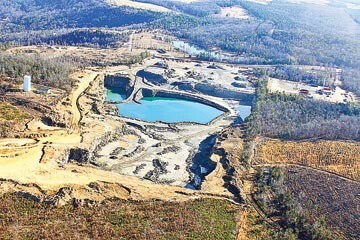 Aerial photos courtesy of Save Greer's Ferry Lake Inc.
Drilling pads, quarries, and trucks are sources of sediment. A drilling pad sits south of Greer's Ferry Lake in Heber Springs; Maurice Lipsey. Heber Springs, Arkansas, has been a recreation and retirement destination for Memphians since the 1960s. Located just 134 miles from the Bluff City, the mountains, the waters of Greer's Ferry Lake, and the abundant trout on Little Red River are the basis not only of a tourism industry but the retirement plans of many Memphians. "We call this Little Shelby County. Memphis is our main draw," Heber Springs mayor Jackie McPherson says. But now McPherson's city sits at ground zero in a battle between two economic forces: On one side is a community built on natural beauty. On the other is the natural gas industry, an economic juggernaut that employs thousands and is a source of income to a historically poor region. 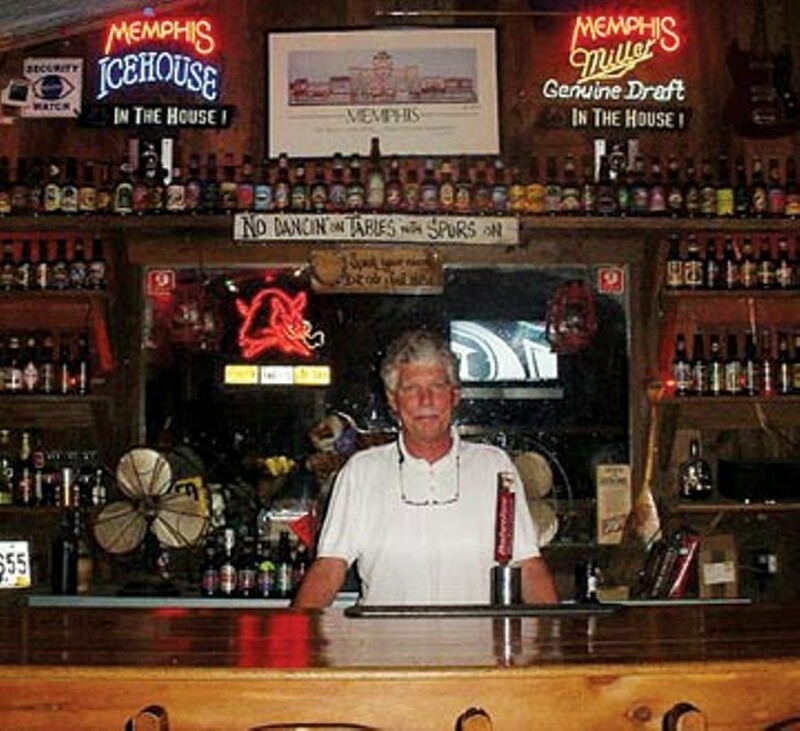 Maurice Lipsey, whose name will ring a dinner bell to Memphians who remember his family's fish markets, owns Fat Possum Hollow, a 250-acre resort on the Little Red. His website touts its natural amenities (the river, trails, horses, hunting) and the luxury accommodations. It's his home and his vocation. "Most of my customers are from Memphis — I'd say 90 percent," Lipsey says. "Most of the people who own property around here on the river are from Memphis. Myself included." Lipsey is among many here who see an industry of outsiders running rampant and jeopardizing the natural beauty and economic engine of the area. "On my property, right across the street, they have fracked, drilled six wells," Lipsey says. "They have started back up again for the last week, and 24 hours a day, seven days a week, they are bringing trucks in and out of there — at all hours of the night. You can't sleep." It can be said that the town of Heber Springs owes its existence to large-scale environmental exploitation. The dam impounds the Little Red River and creates Greer's Ferry Lake, which provides hydroelectricity and drinking water for the region. The dam's dedication ceremony was President John F. Kennedy's last public appearance before his fatal appearance in Dallas in November 1963. The power station was commissioned in 1964. The lake itself is an energy-production by-product. But since its creation, it has supported a local economy with incomparably clear water and a bounty of bass, walleye, and striped bass. 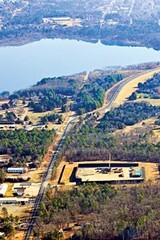 Heber Springs lies on the eastern edge of the Fayetteville Shale, a "play" as the natural gas industry calls it. Heber Springs is merely a drop in a giant bucket into which the industry has poured more than $2 billion of investment since 2009. Despite a nosedive in natural gas prices, developments in extraction technologies have opened up reserves once thought unprofitable at much higher prices. "We are very proud that they are here. Those are good-paying jobs," McPherson says about the drilling companies. 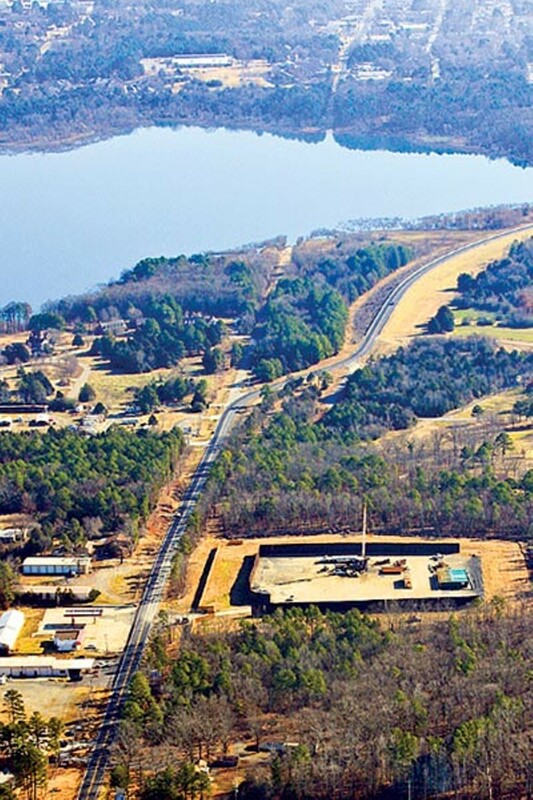 The city of Heber Springs leased about 450 acres to Chesapeake Energy for an initial payment of just under $2 million and a 20 percent royalty on the gross income. The city used the funds to develop its most congested intersection. "Now we have national chains looking at that intersection. Those are new retail businesses that pay taxes, increase employment, and it helps our traffic flow," McPherson says. "The royalties should help us grow and invest without raising taxes." Similar benefits come to thousands of property owners who lease their mineral rights to drilling companies. The income was essential for some in this hardscrabble country. For others it was gravy on luxury property. Either way, few complained, initially. "Originally it was manna from heaven. Those folks in those old rocky farms — they were happy," Greg Seaton says. Seaton is a retired Little Rock native. He works as a fishing guide on the Little Red River. Rising energy prices drove new techniques for natural gas extraction, particularly horizontal drilling and hydraulic fracturing. These opened up new plays, most importantly the Barnett Shale of Texas in 1999 and the Marcellus Shale in the northeast around 2005. The Fayetteville Shale runs across Arkansas at depths from 1,500 to 6,500 feet and ranges in thickness from 50 to 325 feet. In the early 2000s, Southwestern Energy found similarities between the Barnett Shale and the Fayetteville Shale. This set off an oil rush throughout Arkansas. In 2004, there were 13 wells worth $640,000. By 2007, 603 wells produced gas valued at $651 million, according to a study done by the Center for Business and Economic Research at the University of Arkansas. The economic benefits in that study were based on price estimates of around $6 per MMBtu (one million British Thermal Units). Prices peaked at more than $8 in 2008. The warm winter of 2011-2012 led to a glut in gas, with inventories 41 percent higher than last year. The average price for 2012 is estimated to be $3.17 per MMBtu by the Department of Energy. "They continue to turn a profit even with low prices," study author Kathy Deck says. "It still costs more money to invest, but the industry has gotten really good at identifying where to drill to get bang for the buck." But even at the low prices, the scale of activity is overwhelming. Chesapeake Energy sold its Fayetteville Shale holdings to BHP Billiton Petroleum in February 2011 for $4.75 billion. The other major player in the area is Southwestern Energy, a conglomerate with subsidiary interests in exploration, extraction, and transportation. Southwestern spends $2.8 million per well and invested more than $2 billion in 2011 and 2012. Both companies were asked to provide local sources that had found work with the industry. Calls and emails to Southwestern were not returned. BHP supplied a link to the 2008 study. 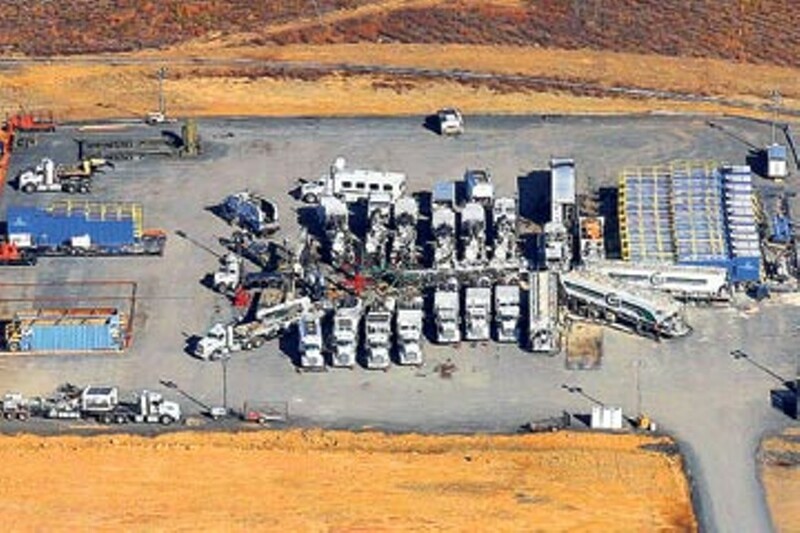 Natural gas drilling is a complex and expensive job involving several processes, including: exploration, obtaining mineral rights, installation of drilling equipment, drilling operations, extraction, field processing, gathering, and transportation. "Fracking," or hydraulic fracturing, involves millions of gallons of highly compressed fluids blasted into rock formations, creating fractures that allow natural gas to escape. The entire process can require three to five million gallons of fresh water. The fluids are saline mixes and other chemicals, many of which are considered proprietary trade secrets. The fluids and the by-products of the gas extraction are collected in a pool and disposed of by four common methods: treating the water and returning it to surface water, injection into deep water formations, recycling, and even spreading onto roads for dust suppression. "The reason I enjoy owning property here is to enjoy fishing on the Little Red River," says Jim Julian, a Little Rock native and former president of the Arkansas Bar Association. "We are close enough to a rig that we can hear construction and the sound of the drilling at times. Those things are somewhat noisy. It depends on the time of day," Julian says. "My concern is that the science of how this effects the habitat of the trout has not been done. They are taking water out, and it's probably getting back in." The Arkansas Natural Resources Commission grants the permits required to get water from state waters for operations. In 2007, the commission received three requests to move water from rivers for use at other locations. The next year there were 121 requests, and the number has remained above 400 every year since 2009. "You've got the road kicking up dust. In fact, when I drove over here, it looked like there was a fire burning. But it's not a fire. It's the dust from what they are doing over there right now," Lipsey says. This dust presents a second risk: sediment. Clinton, Arkansas, in the more heavily exploited, adjacent Van Buren County, recently had its water supply tainted due flooding and sediment. While normal development creates sediment that impedes watersheds and changes the chemical make-up of aquatic habitats, the problem has dramatically increased as gas companies have cleared roads and "pads" covering several acres for operations. "They started drilling about eight months ago, and that's when I started discovering the methane in my water," Lipsey says. He's had to abandon his own well and have his property placed on the municipal water system. Shale gas is typically comprised of over 90 percent methane. Two studies have confirmed the role of drilling activities in the contamination of water wells. 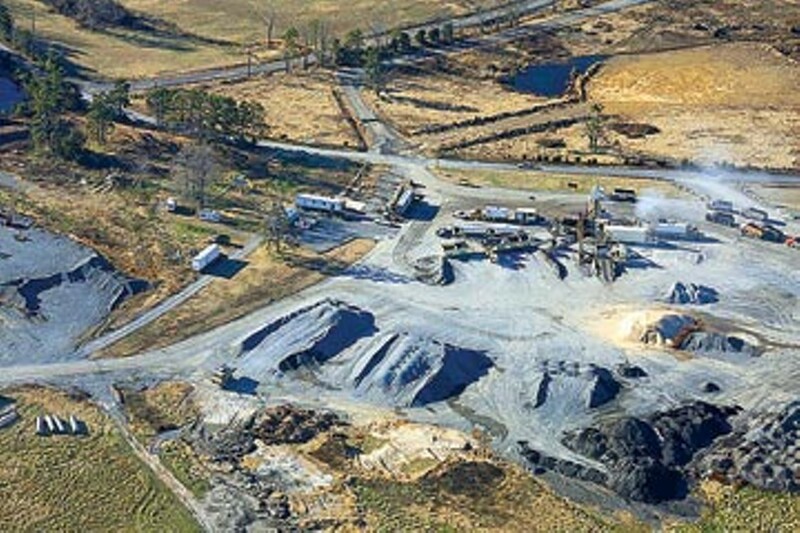 One by Duke University on drilling in the Marcellus Shale in Pennsylvania, reported in the Proceedings of the National Academy of Sciences, found that "methane concentrations in drinking-water wells increased with proximity to the nearest gas well" and were 17 times higher in extraction areas than in those without drilling activities. An EPA study of water supplies in Pavillion, Wyoming, found methane, petroleum hydrocarbons, and other chemical compounds "consistent with migration from areas of gas production." Although the levels were "below established health and safety standards," the U.S. Department of Health and Human Services later reviewed the EPA's data and advised the well owners to use alternate sources of water for "drinking and cooking, and ventilation when showering." "There may have been methane in the well, but it's nothing like it is now," Lipsey says. He worries that it will decrease the value of his property. "You're going to have to disclose that you've got methane in your water well." "We want local judges and politicians to think about the retirement and recreation," Seaton says. "[The gas companies] had their guns drawn and their ducks in a row when they hit the state. They wanted to try to get as much done as possible before the agencies could act." The federal government granted the industry exemptions from the major regulatory acts including the Safe Drinking Water Act. That leaves the monitoring and rulemaking up to the state. The Arkansas Oil and Gas Commission and the Arkansas Department of Environmental Quality regulate natural gas wells. Shane E. Khoury is the deputy director and general counsel for the Arkansas Oil and Gas Commission (AOGC). He thinks there is sufficient regulation. "The Oil and Gas Commission is serious about doing all we can to ensure that drilling and fracking is done in a safe way in Arkansas. Although accidents may occur, we have passed many regulations to ensure that the practice in Arkansas is highly regulated in an effective manner," Khoury wrote in an email. AOCG has nine members and, by law, a majority of members must have experience in the development, production, or transportation of oil or gas. "Drilling and/or 'fracking' does have a potential to cause contamination. I am not saying that issues didn't arise or that they weren't serious events. I am just saying that they are often taken out of context and reported as global problems for fracking everywhere," Khoury wrote. He points to shallow production wells in Wyoming and a blow-out on a Chesapeake site in Pennsylvania where fluids spilled or discharged onto the surface due to poor regulatory oversight. "The state allowed frack flowback to be treated and released into streams and other surface waters. This same fresh water flowed downstream and was eventually used for drinking water. This issue was caused by surface discharge, not the fracking process." Khoury points to Arkansas regulations such as a moratorium on disposal wells following increased seismic activity, requiring additional seismic data for disposal wells. Arkansas is the only state to impose a statewide noise regulation and amended casing and construction requirements to protect water supplies. Khoury notes that Arkansas is the second state to require the disclosure of chemicals used in hydraulic fracturing: "The reported fluids, additives, and/or chemical constituents are submitted to the AOGC under penalties of perjury." However, the state regulation on fluids exempts any fluid declared a trade secret. When Teresa Marks, director of the Arkansas Department of Environmental Quality (ADEQ), came into office in 2007, the department was overburdened. Seventeen regular water inspectors responded to complaints, in addition to regular duties including wastewater treatment and oversight of industry. "They had a full plate without the burden of the Fayetteville Shale," Marks says. ADEQ was overwhelmed by the number of complaints as the companies were laying the groundwork: making roads and constructing pads. Help came, ironically enough, when the Arkansas Game and Wildlife Commission leased some its land for drilling and used a portion of the funds to underwrite four additional ADEQ inspectors and another supervisor dedicated to permitting and inspection duties. Marks says industry has made efforts to clean and recycle water, something that was not done before. Sand mining (for use in the fluid mix), sediment, and air pollution are also concerns. "It's in the industry's best interest not to have those fugitive emissions. They are very difficult to see. It would be nice to do more testing, especially with the compressor stations," Marks says. She would like to do more data gathering and additional testing of ground water and adjacent waterways. While drilling has dropped off since Marks arrived, there is still concern about the disposal. Treatment centers, where fluids are treated and released to local surface water, are regulated by ADEQ. Injection wells, which pump fluids deep into geological layers, are regulated by AOGC and ADEQ. Recycled fluids can be re-injected into wells as fracturing fluid. Recycling is not regulated by permit but is subject to AOGC rules. Spreading water on local roads for dust mitigation is unregulated unless it otherwise presents a threat to state waters. Even the industry's harshest critics concede that some dialogue has taken place. "We are not at all in disagreement with ADEQ or ANR [Arkansas Natural Resources Commission]. They were overrun. But we need better regulations, and it has to come from the legislature," Greg Seaton says. He has met with Southwestern, Chesapeake, and others. "They are taking notice. Some have been helpful. They have worked with us on best management practices. I don't want to muddy that up." In 2011, Chesapeake Energy conducted tests on Greer's Ferry Lake and set off a groundswell of community concern. The issue surrounded the Army Corps of Engineers Little Rock District's release of the permit. The Corps has responsibility for Greer's Ferry Lake. "We appreciate people's concerns, and we share those concerns. It is a possibility that a gas company could drill under the lake. The Corps of Engineers did not always buy the mineral rights," says Laurie Driver of the Army Corps of Engineers. Local attorney Richard H. Mays sued the Bureau of Land Management — which administers the mineral rights — along with the Forestry Service and the Corps of Engineers to place a moratorium on drilling under the lake and in the national forest until an environmental impact statement can be completed in accordance with the National Environmental Policy Act. "We are in the process of trying to settle. But I don't think they have the leases issued. And I have a close relation with them, because I have sued them a lot," Mays says. Mays downplays the threat of drilling under the lake and sees drilling in the forest, threats to the Little Red River, and wastewater containment as more important threats. "I don't think there is immediate cause for concern," he says of drilling under the lake. "There would be a public uproar." Mays' concerns are for the river and the forest. "It takes 2 to 3 million gallons of water per well. That's taken out of the water cycle," Mays says — adding that there is probably improper disposal going on and that some companies are probably getting away with it. "I don't have much confidence in the regulators, because they don't have enough people to do it." Most here will have to live with the bargain that the industry will get its way until something catastrophic happens. If nothing catastrophic happens, the industry will call their operations a success. Whatever the final outcome, the anxiety of the risk and the day-to-day burden of trucks, dust, and noise all take their toll on the notion of a placid, secure retirement or a livelihood based on natural settings. "This property is in jeopardy because of what they are doing," Lipsey says. "This is a resort property, where people come to get away from the rigors of, say, Memphis, Tennessee."